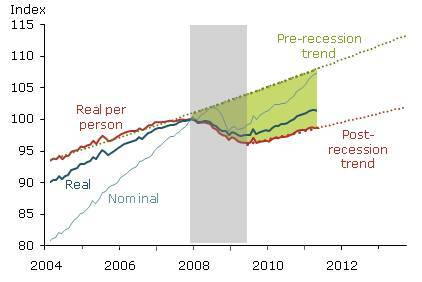 Federal Reserve Bank of San Francisco Senior Economist Keven Lansing has an interesting research article regarding the impact the Great Recession has had on personal consumption expenditures. What follows is a brief excerpt from his Economic Letter (full article here) and an additional graph regarding retail sales at the national level. First, the summary of the article. 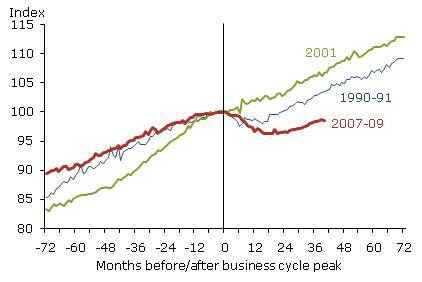 The first graph, copied here from the original article, “compares the trajectory of monthly real personal consumption expenditures per person during the Great Recession with the corresponding trajectories for the two prior recessions of 2001 and 1990–91.” Lansing notes that it took 23 months for consumption per person to return to its pre-recession peak after the 1990-91 recession and the 2001 recession was abnormal in the sense that consumption did not really decline. Conversely, through May 2011, some 42 months since the start of the most recent recession, per capita consumption remains 1.6 percent below its pre-recession peak. Finally, the last graph illustrates U.S. retail sales (as reported by the U.S. Census Bureau). 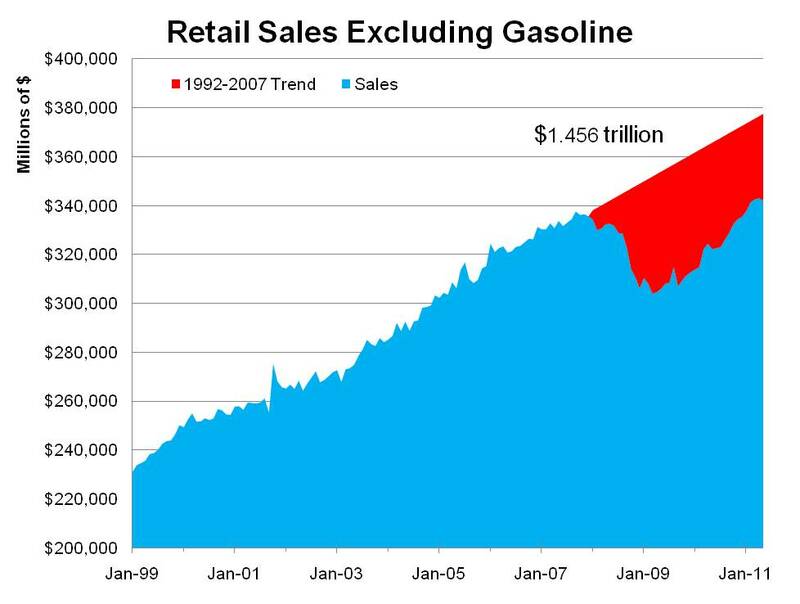 This data excludes gasoline purchases, which tend to fluctuate quite a bit due to the price of oil and gasoline. The purpose of excluding gasoline is to gauge the underlying strength of the consumer and his/her purchases. The red portion of the graph is the amount the level of retail sales have fallen below the 1992-2007 trend growth line over the past 3+ years. That is, if retail sales had continued to grow at their average rate over the past 3+ years, the level of sales would have followed the top red line. Given the severity of the recession on wages, jobs and asset values, retail sales fell quite dramatically during 2008 and into early 2009 and recent growth has yet to return the level of sales to their pre-recession trend line. Overall, retail sales since Jan 2008 are a combined $1.456 trillion below their pre-recession trend, with data through May 2011. This is a very significant portion of consumer spending and has contributed to the slow economic growth the U.S. economy has experienced in recent years. Currently, retail sales excluding gasoline are 9.42 percent below trend in May. This is an improvement from the depths of the recession when sales were 13-14 percent below trend, however, just like the overall economy, consumer spending remains significantly below pre-recession trend levels.